Philanthropy has played a significant role in the development of the HBS campus, beginning with an extraordinary gift from financier George F. Baker. Established in 1908 with an entering class of 80 students, Harvard Business School conducted its first classes in buildings scattered across the Harvard College campus. 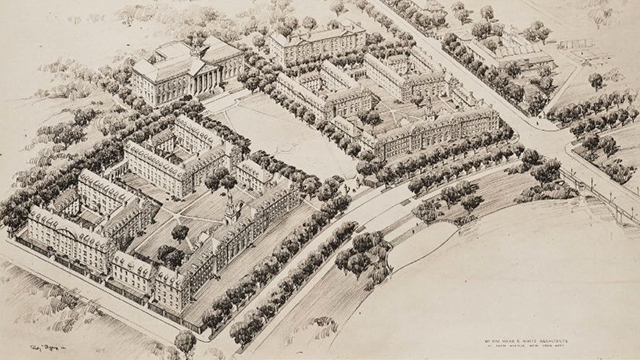 Donham’s vision, George F. Baker’s (1840-1931) extraordinary gift, and an inspired collaboration between architects McKim, Mead & White and landscape designer Frederick Law Olmstead led to the expedited construction of the first twelve HBS buildings between 1925 and 1927. Facing the banks of the Charles River in a pattern that follows its graceful curve, the original structures represented a continuation of the stately, Georgian Revival style that dominated the University’s buildings across the river. To learn more, visit Baker Library Historical Collections Exhibition “A Concrete Symbol / The Building of the Harvard Business School, 1908 – 1927) here. 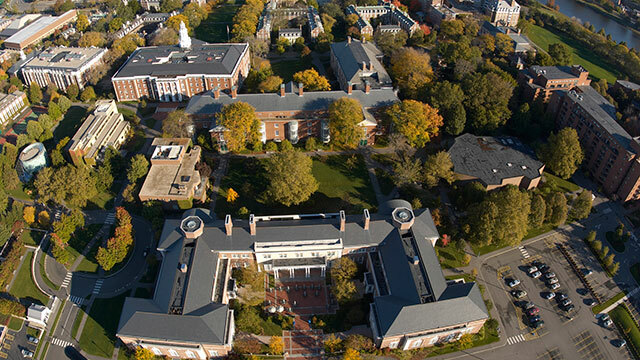 Those first HBS facilities, with modern upgrades, still represent the core of today’s vibrant campus, now comprised of 33 buildings on 40 acres of land. Over the years, the School’s leaders have added significantly to the institution’s footprint in response to growing enrollments, changing needs, and enhanced capabilities. New buildings have been designed to blend harmoniously with older architecture and—in keeping with the early founders’ intent—to maximize opportunities for students, faculty, and visitors from diverse backgrounds to exchange ideas, network, and establish lifelong bonds. Generous contributions of HBS alumni and friends who believe in the power of business—and business education—to make the world a better place have helped to create and sustain this unique learning community. The biography of each named building tells the impactful story of support on which this campus is built. Harvard Business School was originally named the “Harvard University, Graduate School of Business Administration, George F. Baker Foundation,” in recognition of the remarkable generosity of George Fisher Baker, Sr. (1840-1931) whose extraordinary 1924 gift funded the construction of the original campus. A prominent financier, philanthropist, and president of the First National Bank of New York (later known as Citibank), Baker was a renowned force in US finance and industry. At the age of 23, he invested $3,000 to become an original shareholder in the First National Bank, where he worked as a teller. Just 14 years later, he became the bank’s president. Under his conservative management, the institution remained financially sound throughout the panics of the late nineteenth and early twentieth centuries. Baker’s business acumen extended to serving on the boards of more than forty corporations, including several failing railroads, that he bought and revitalized. He also had great success investing in the utilities, steel, and rubber industries. Although he famously kept a low profile, leaders of business and government consistently sought and received his advice.